For the second day of the mega marathon, I have the Balehannu Dose or the banana dosai. Thanks to this marathon, I discovered the amazing variety of dosais made in Karnataka. I have been consciously trying out more local food since I moved back to Bangalore two years ago but my dose knowledge was kind of restricted to the classic Benne Dose. But as I was researching for this marathon, I discovered so many types and varieties of doses that I am absolutely astounded. This dose does not need any lentils. It is a mix of idli rice, flattened rice (aval) and a banana. I was quite intrigued by this and thought of trying it immediately. The daughter loves it and calls it yummy pancake. There is another version using jaggery but since I ran out of jaggery, I picked this one which does not need it. It is so beautifully soft and melt in your mouth consistency. Do try it. Thanks to mega marathon, even I’ll get to know variety of dosas, otherwise my knowledge of dosa is limited to usual rice and urad dal dosa. I guess banana and poha adds to the fluffiness of the dose. It looks so good and as it would be mildly sweet, it would be awesome with spicy sides..
Banana dosa looks super fluffy and spongy, such a fabulous dosa. Am sure with a super spicy side dish this dosas will tastes absolutely delicious na. That is a fantastic find, Sowmya. Love the texture. I hope my older one will tolerate the banana in this dosa. I so want to try it. That is such a wonderful recipe and such a easy one as well. Great find for the alphabet and I am really curious to see how it tastes. This marathon is a learning curve for me , banana in a Dosa ! I didn’t know methi too would be added , the Dosa looks absolutely soft and melt in the mouth kinds . The texture looks amazing ! Any challenges we participate is a learning experience. I too am learning about different varieties of dosas. This one with banana is something I’d love for breakfast. Good share. 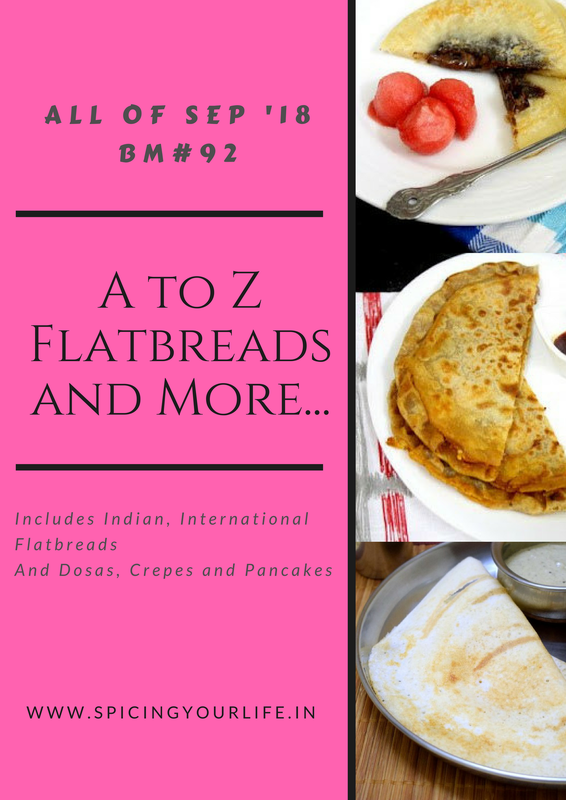 Sowmya, I came about so many dosas from Karnataka that it almost felt I was doing an AtoZ Karnataka Dosa Varieties. I had to consciously change some of the choices.. this was on my list but I wanted to do another version for B and went with it..your dosa has turned out so good.. I remember making something similar eons ago for one of the themes and my kids called it pancakes! Yes, they are so yummy and soft! Good pick Sowmya and the first click so so nice! wow.. another different type of dosa and thanks for sharing different list. now i have big list of dosa recipe.